Dental implants are a good choice to replace missing teeth and fill gaps in your smile. They can help restore your smile and your confidence. Dental implants create the foundation required to insert replacement teeth that look, feel and work like your natural surrounding teeth. A dental implant is an artificial root inserted into the jaw bone to replace the root of a natural tooth. It is made of bio-compatible titanium metal. Once the jawbone grows and integrates with the implant, it acts like a natural tooth root and can support an artificial replacement tooth or crown. Implants not only have an esthetic benefit, they also help to preserve the structure of the jawbone and prevent bone loss where they replace missing natural teeth. 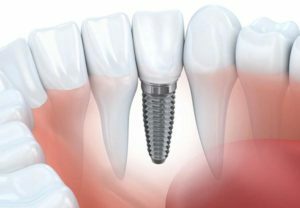 Dental implant placement is becoming a common procedure to replace a missing tooth or teeth and to provide stability to a new or existing denture. Depending on the type, location, number of implants placed and available bone, it may take one to multiple visits to complete treatment. Dental implants can last a lifetime with proper care and good oral hygiene. If you have lost teeth due to decay or injury, dental implants may be the right treatment plan to help make your smile healthy and beautiful.